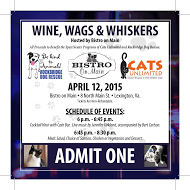 We held a very successful event hosted by Bistro On Main and Rockbridge Animal Alliance to benefit the spay/neuter funds of Rockbridge Dog Rescue and Cats Unlimited. Tickets sold out! Jennifer Kirkland and Bert Carlson volunteered th eir time and played during the cash bar and the meal was a Bistro house salad, choice of: Poached Salmon with lemon hollandaise sauce, rice pilaf and green beans almondine; Chicken Marsala with rice pilaf and green beans almondine or Penne Pasta in a light tomato broth with spinach and mushrooms; and peach cobbler a la mode for dessert. We also raffled off a $50 gift certificate to Bistro On Main donated by Cornerstone Bank and a pet photo shoot donated by the photographer herself- Fran Fevrier. The night was lovely and everything was absolutely delicious.